He is a 5 month old Stud colt, SON of Hangon Johnny (If you know anything about RIDs, Johnny is sought after- a lot) and a purebred colored mare (not RID, but purebred ID). I talked to the owner and found out she did not want to trade horses. Sigh. It was expected but I took the chance and got the answer I expected. Anyhow, after chatting with the owner and sharing our pony-tude experiences we found that we both wanted to start driving horses. I have the cart dreams are made of, she has the horse built for the sport (the colts mother). SOOOO we are trading this week later!!! This is a breed I have been researching for 5 years and trying to save up for, with the intentions of buying or breeding a much lesser quality purebred than that of what I am getting. I expected another 5 years minimum before I could afford a ID or RID mare to breed, or buy a foal outright. 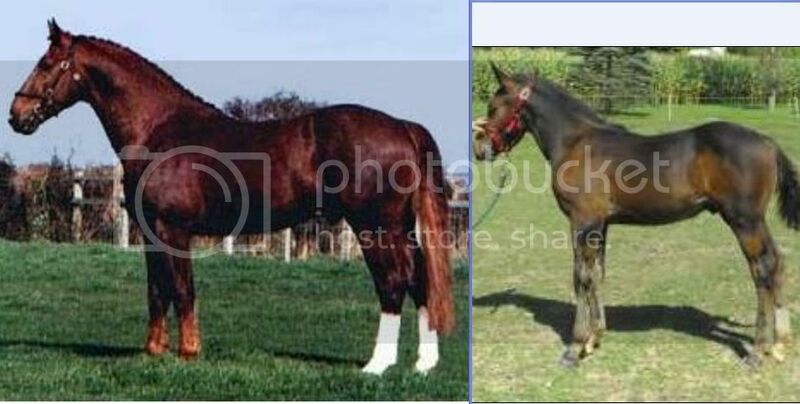 I found a picture of his Sire standing up for conformation (I think it is the ONLY one taken this way) and compared them side by side. They look like they could have been the same horse! Wanted to post a picture and let you all look. Sorry the picture is a little distorted. Are you in the MN area? OMG! Good for you! Congrats! Very nice! I've worked with ID's before and they are really wonderful horses. So many of the sires leave strong stamps on their babies. Good luck with him! Thanks everyone! Though on a sad note, I found out tonight that Johnny passed. Such a nice horse too. RIP. There have been far too many wonderful RID stallions pass in the last couple of years. WOW you are lucky!!!! Good luck with him! !